The RRP of the tile cutter alone is £264.06 (+VAT)! The Silver Kit is ideal for professional tilers and plumbers who are dealing with ceramics and medium-thickness porcelain tiles every day. 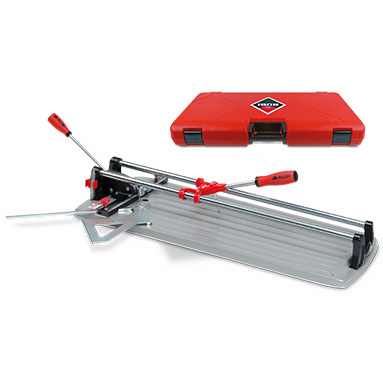 Rubi TS-66-MAX tile cutter - ideal for cutting ceramic & porcelain tiles up to 66cm in length, 15mm in thickness. 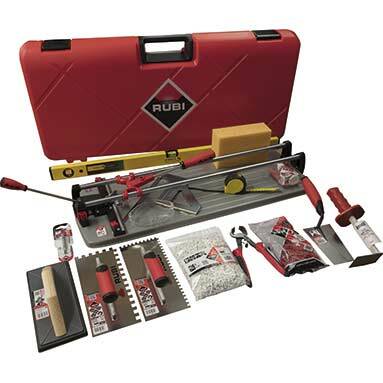 Includes shockproof carry case, 6mm & 10mm scoring wheels and 5 year warranty (with Rubi Club). Extra 8mm scoring wheel for floor ceramics. Maintenance kit to help ensure the longevity of your cutter. Venitex Brava clear anti-scratch safety glasses. Rubi Nippers for Ceramic Tiles - with hardened tungsten carbide edges. Ansell tile remover chisel - especially designed for removing large quantities of tiles from walls and floors. Rubi Flex stainless steel notched trowels x2 - 6mm & 10mm notches. Rubi grout float - soft rubber - for perfect finishing of tile joints. Stabila spirit level - 70-2 Series - 90cm (36in) - 3 vials. 5m (16ft) pocket tape measure. Rubi tile spacers 2mm x 1,000. Rubi tile wedges 5mm (for splashback tiles) x 500.